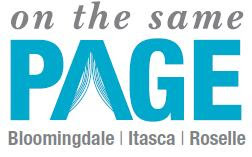 "On the Same Page" events continue on Sunday, 10/9, at Bloomingdale Library. Stop by the Library at 1:00 p.m. for an Artists' Reception. The Bloomingdale Artists Association and the Loose Threads Quilt Group will display works of art inspired by The Great Gatsby followed at 2:00 p.m. by "Gibson Girls to Flappers," a fashion showcase and afternoon tea featuring 1920's fashions modeled by Ruth Thomas and Chloe Berg, historical dress enthusiasts. Bloomingdale Library is located at 101 Fairfield Way, Bloomingdale. (630) 529-3120.